While roaming the aisles of our local supermarket out in the 'burbs, we stumbled upon this new product in the freezer section. 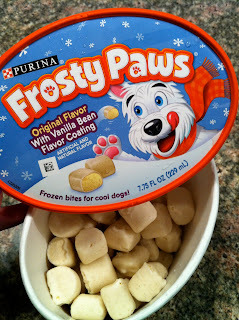 It looks like the folks over at Purina have taken bite-size pieces of their Frosty Paws formula and coated with a vanilla bean flavored shell. Though there was no info about these Frosty Paws bites on their website or Facebook page (this drives us a little bit cuckoo...), we have reason to believe that they may be a new release for summer! No word on whether they're part of a limited run or ongoing. 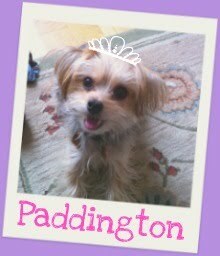 Regardless -- the most important question, what did our Chief Barkzilla Taster think? Great blog..How much is that? Thanks! Unfortunately, they discontinued these. If you visit their FB page, tell them you want them back! 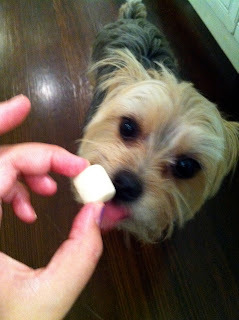 You can really see how eager your dog to taste that frozen bites. I heard that they discontinued this product already. I hope that the manufacturer listens to its consumers. Thank you for your email letting us know of your disappointment in being unable to find Frosty Paws® Frozen Bites Treats for Dogs at your local market. I realize how frustrating it can be when you can't find your favorite dessert treats. Unfortunately, this particular product line has been discontinued. Each year, we evaluate our current flavors and products, adding some new ones while discontinuing those that aren't selling as well. We listen closely to our consumers and if we hear from enough shoppers who share your disappointment, we will certainly consider bringing this product back into our line-up. We appreciate your taking the time to contact our company to let us know of your flavor preference. If you want them back - PLEASE email!!! !